My Dear Sir. Your long letter received. Prevent, as far as possible, any of our friends from demoralizing themselves, and our cause, by entertaining propositions for compromise of any sort, on “slaver extention.” there is no possible compromise upon it, but which puts us under again, and leaves all our work to do over again. Whether it be a Mo. Line, or Eli Thayer’s Pop. Sov. it is all the same. Let either be done, & immediately filibustering and extending slavery recommences. On that point hold firm, as with a chain of steel. Lincoln, and many Republicans, were concerned that any promise to extend slavery into southern territories would lead to “filibustering” — adventurers like William Walker attempting to acquire new lands for slavery. Many Southerners had advocated an expansion of American slave states into Mexico and the Caribbean. 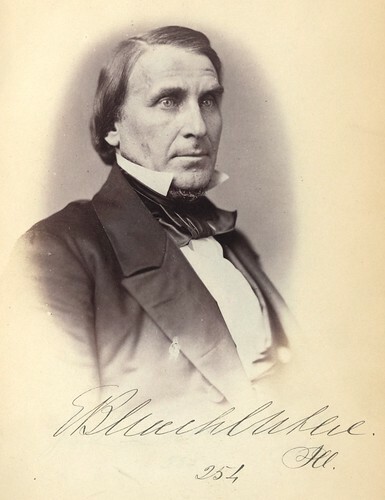 By the way, Washburne’s brother Israel Washburn was governor of Maine. No, that’s not a typo; they spelled their last name differently. This entry was posted in Illinois, Slavery. Bookmark the permalink. Also brother (one of seven) of Cadwallader C. Washburn. Congressman (and later governor) from Wisconsin, Colonel of 2nd Wisconsin Cavalry eventually Major General in the Western Theatre of the war. Forgot to mention; Cadwallader also founded several companies that would eventually be known as General Mills.